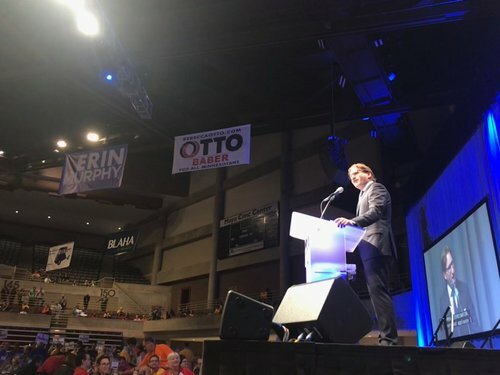 Martin on potential primary challengers: "They need to know that they're taking on the full party and we're going to make sure that we defend and protect our endorsements." 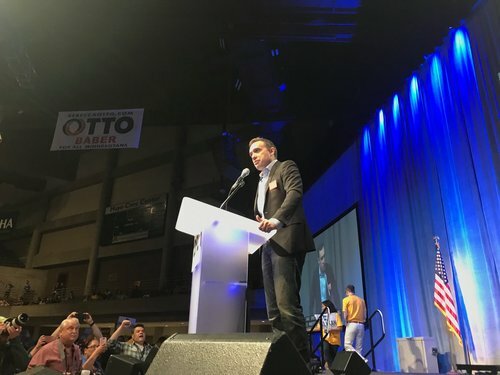 DFL delegates nominate Matt Pelikan and incumbent Lori Swanson nominated for attorney general. Pelikan will speak first. In intro for Lori Swanson, former AG Mike Hatch rebuts Matt Pelikan's criticisms of Swanson. A series of supporters speak on behalf of Lori Swanson, but she does not address the delegates ahead of balloting. 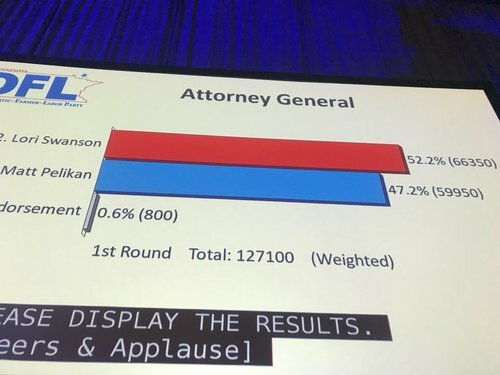 Swanson fails to get 60% on first ballot. 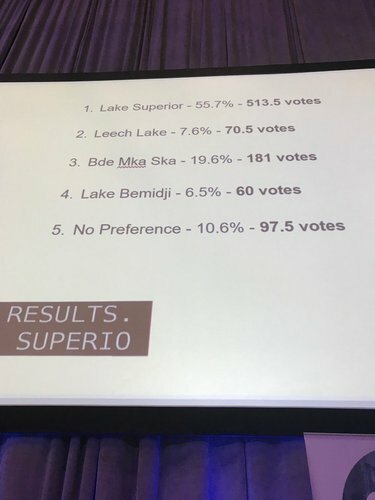 Second ballot coming. 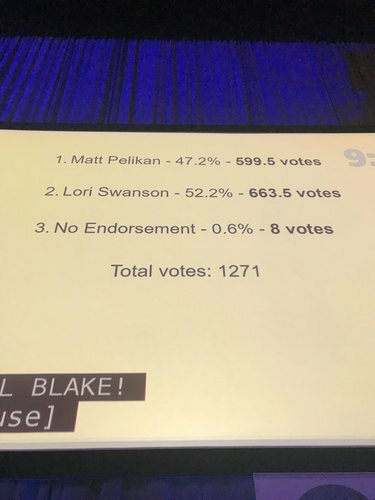 First ballot results: Swanson 52.2%, Pelikan 47.2%. Incumbent Lori Swanson withdraws from attorney general endorsement. 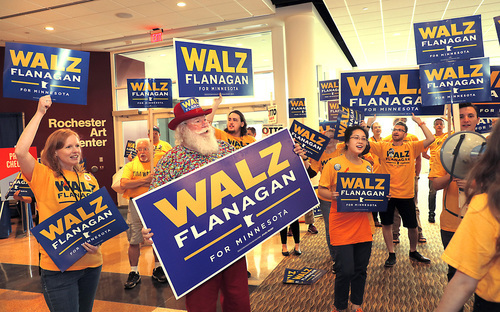 DFL delegates endorse Matt Pelikan by acclimation. 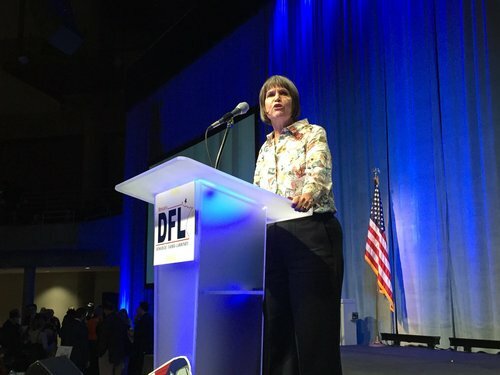 “I can’t say enough about how crucial, absolutely crucial it is to reelect one of our DFL candidates to this seat January,” Dayton told the DFL crowd. Erin Murphy said it's not time for "tippy-toe kind of politics." Mentions Tim Pawlenty: "We know his playbook….when the going got tough, he quit and he went away." Rep. Flanagan: "I did not lead the fight to raise the minimum wage, or throw down for children and families at the legislature, or get up every day to fight for racial and economic justice, just to be someone’s arm candy...I joined this ticket because I know Tim, I trust Tim." Tim Walz sounds like he's losing his voice a bit: "I grew up farming with my family...went to high school with a graduating class of 24 - 12 were cousins. I learned my values from my parents." Talked about how his dad died when he was young, mom supported his family.